Most of the other non-native frameworks that I’ve used so far are often very good, but lack low-level connectivity modules such as bluetooth (though they pretty much do anything else…). 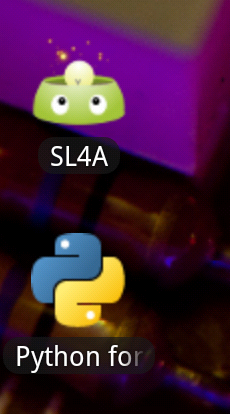 So while hunting around for what I might be able to use for developing a bluetooth app, I ran across SL4A – scripting language for android, and it’s corresponding python module: Py4A – python for android. It’s quite an underrated environment – for something that can do so much, there is less “buzz” around it than I expected. It really can do wonders. Probably the main reason that it hasnt gone mainstream is the inability to package the resulting scripts you write into standalone apps. However, in some situations it is extremely useful – like when you are building a personal app, or, as is my case, your distribution platform is a controlled one and you can pre-install and setup the SL4A environment. 1. A bluetooth “client” device that will display the data sent to it over bluetooth in a webview. 2. The bluetooth server can be anything really, but in my case it will be another android device, so i’ll provide the code for the server too.